The progressive liberation of East Ghouta, Syria, from Western-supported terrorists highlights and confirms what we already know. We have seen this all before. First of all, a chemical factory was discovered, indicating yet again that the terrorists use chemical weapons. Second, the discovery of the CW plant occurred at the same time that yet another false flag terror operation has been predicted. None of these false flag “Assad gasses his own people” operations have withstood the scrutiny of independent investigations. They have all been perpetrated by the West and its proxies, most notably the White Helmets, al Qaeda auxiliaries, as fake pretexts for more war. Third, we see yet again that the mainstream media is an accomplice to Western crimes. Reporter Sharmine Narwani, who visited the abandoned site, noted wryly that none of the mainstream media reporters chose to visit the “makeshift chemical lab”. The alternative to the popular Assad government is not an alternative at all. It is slavery and despotism. As more areas are liberated by the SAA, we will see more of the same. Tim Anderson, ‘There is zero credible evidence that the Syrian Arab Army has used chemical weapons.’ Muslim Press. 20 July, 2016. 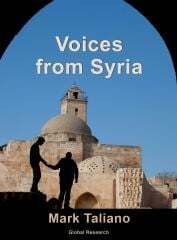 ( http://www.muslimpress.com/Section-opinion-72/105186-there-is-zero-credible-evidence-that-the-syrian-arab-army-has-used-chemical-weapons ) Accessed 14, March, 2018. “First group of 50+ civilians safely leaves E. Ghouta via humanitarian corridor – Russian MoD.” RT. 11 March, 2018. (https://www.rt.com/news/420990-ghouta-civilians-leave-corridor/) Accessed 14 March, 2018.